So you will go home today! I was thinking... setting up your program, maybe you should see a nutritionist to make sure all the molecules are compatible - that some don't take some others out. This is a very tricky and very important matter. You want to keep your sodium level high. 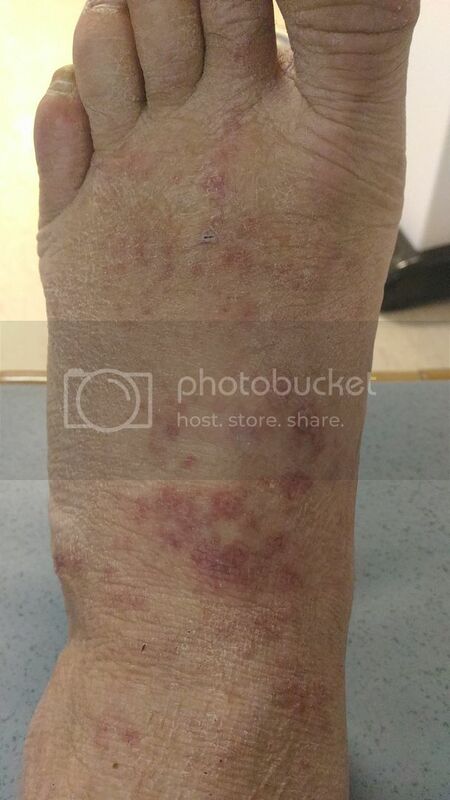 I think the rash can be cured and gotten rid of with the olive extract, the oregano extract and all the other advice on the web page. You send out the questions. We will try our best to find the right answers. (09-16-2016, 12:20 PM)MadameConcorde Wrote: So you will go home today! I am not saying "I will go home today" That will all depend on those all important blood test results later. As to the rash, that has probably doubled today and become quite itchy. It's also starting to look quite red and raw. I will try to get a photo of it and post a link to that here. (09-16-2016, 12:39 PM)NODOOM Wrote: I am not saying "I will go home today" That will all depend on those all important blood test results later. You have shown amazing improvement from last week to yesterday. Let's hope the blood tests results will confirm the improvement. 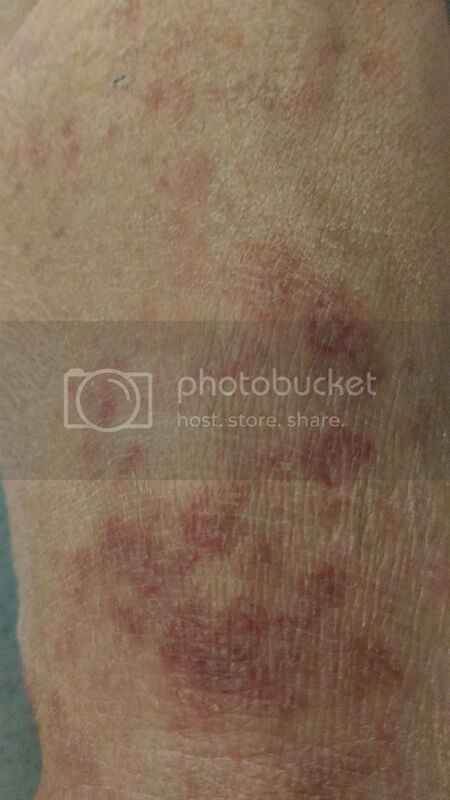 The rash is a whole different story and having it double in 24 hours is not good. Have the doctors said anything? Not that we should trust them but it's their job to assess your overall condition.... every aspect of it. Not that we have to follow what they say. Their job is to Bayer-ize all of us. They are a cast of their own. Big Pharma bought and sold contemptible individuals. 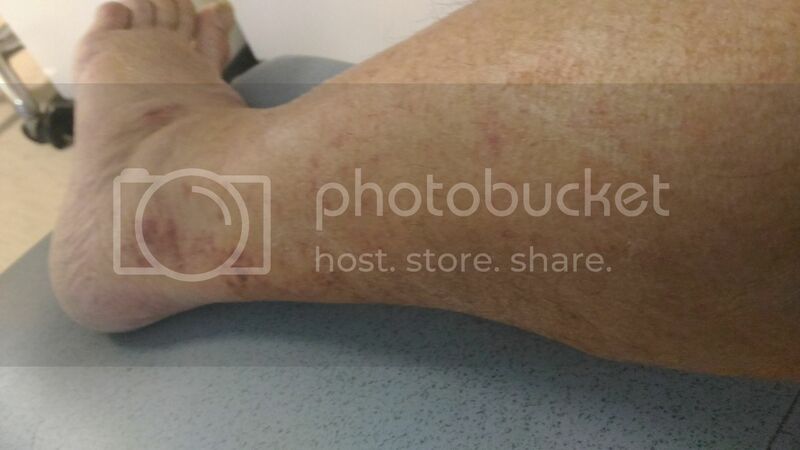 Here are links to those photos of the rash. I hope they all work. They don't look so raw in photo unfortunately so it's a bit deceiving. But It was the bet I could do with this camera on my phone. They did an ultrasound scan that was all clear for blood clots or any other complications. The MRI did not give them any information as it was all ok. So now the idea is it could be a reaction to one of the medicines and they are now going along that investigation path. Well good luck with that. Waiting on the ward round so that I can know the results of today's blood tests. That will be the deciding factor of if there is any chance of being discharged today or not. I will post those results as soon as I know them. I have just had a visit from the doctors who inform me that the sodium level is now stable. Today it has gone up by just 1 to 29 which is ok. They don't want to see it going up too rapidly. They have given me (provisionally) the all clear to go home today, They want to just check and see what provisions are in place to monitor my sodium level whilst at home first. So it looks all good and I should be home later today then. My appetite has also started to return today and that will be perfect if I go home as I will be sorting out a much better diet. Just got to wait now and see what they have arranged for monitoring that sodium level from home. This is brilliant!! Every day you sound a bit better and stronger, and when you get home and are able to really get going with your nutrition, instead of having to wait for whatever insipid protein drink the hospital can come up with, your progress will accelerate! I wonder what that rash is. Itching is a good sign, it means it's healing, you always get pain first, then skin redness, then itching, then it heals. Even if it's spread, it might go away by itself, without you ever finding out what it was. Remember those big bruise-like blotches you had over areas of your body a month ago, did you ever find out what that was? 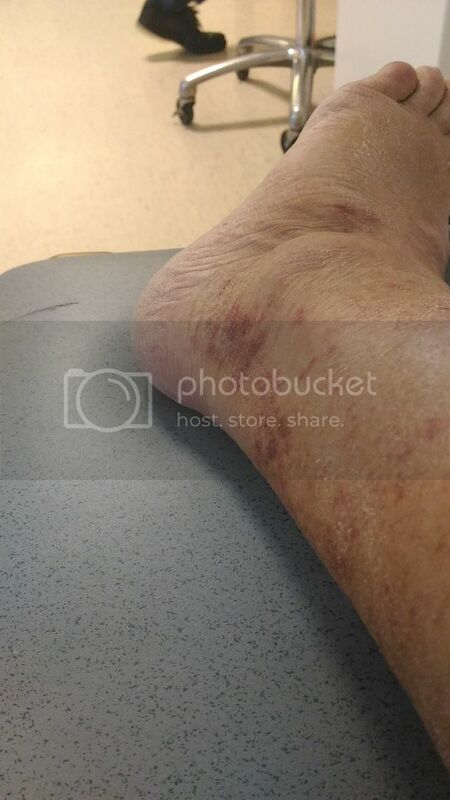 Just a thought, but the affected leg & foot; do you tend to sleep on that side? I have to smile at this a bit. You know those posts you see online sometimes, where somebody says: "Help I've got this weird purple mark on my arm I don't know what it is!!!" People go, "Have you got a photo of it", and they're all trying to work out what it might be. There is always someone on the thread who says, "Look, just go to the hospital." Thank you Chris. Have a great weekend yourself my friend. (09-16-2016, 04:18 PM)Arcturian Wrote: This is brilliant!! Every day you sound a bit better and stronger, and when you get home and are able to really get going with your nutrition, instead of having to wait for whatever insipid protein drink the hospital can come up with, your progress will accelerate! I think they call that "Ironic". Yes I also find it funny. I also have a smile n my face while the mull over platelets and sodium levels and I am getting supplements delivered here that are taking care of these. So while they mull I fix. (09-16-2016, 01:38 PM)NODOOM Wrote: They did an ultrasound scan that was all clear for blood clots or any other complications. The MRI did not give them any information as it was all ok. So now the idea is it could be a reaction to one of the medicines and they are now going along that investigation path. Well good luck with that. This is more wowzers coming from you. Yes, sodium level seems to be the top priority here. I'm sending you a PM. Delivering a message to you from a friend.